WILD ABOUT HARRY: The first Houdini video game? The first Houdini video game? There have been a handful of Houdini-themed video games over the years, but here is what might be the very first Houdini video game, and one that I didn't know existed until it sold over the weekend on eBay (for $12.50). 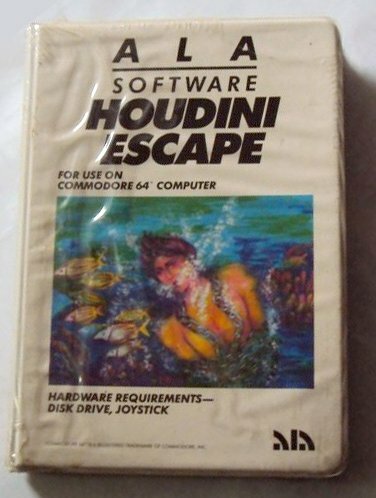 HOUDINI ESCAPE was created by ALA Software in 1983 for use with the Commodore 64, one of the very first computer gaming systems. The description on the back of the box refers to "Henry" Houdini, which proves not everyone in Silicon Valley were geniuses back then. Is there a collectors market for Houdini video games? If so, this would be one to add. I don't know why I never thought to look before but there are a few Houdini related apps for the iPhone. I don't know if it's still available, but the Houdini Art and Magic exhibition had a great app.